13-Stand x 34” Wide Roll Former w/ Regal Coil Feeder and Pneumatic Shear (Rolls 24” Roof Panels). 8-Stand x 28” Wide Roll Former w/ Regal Coil Feeder and Pneumatic Shear (Rolls Insulation Panels). 15-Stand x 18” Wide (Adjustable to 24”) Roll Former w/ Regal Coil Feeder and Pneumatic Shear (Rolls Front Gutter Fascia). Roll-A-Shape 13-Stand x 17” Wide Roll Former w/ Regal Coil Feeder and Pneumatic Shear, Oiler System (Rolls 1 ½” Square Rails). 5-Stand x 22” Wide Roll Former w/ Regal Coil Feeder and Pneumatic Shear (Rolls Aluminum Skirting). Dual Roll Former w/ 6-Stand x 11” and 5-Stand x 8” Roll Formers w/ Pneumatic Shears (Rolls Side Fascia and “U” Rails). 9-Stand x 12” Wide Roll Former w/ Regal Coil Feeder and Pneumatic Shear (Rolls Top Hand Railing). 5-Stand x 10” Wide Roll Former w/ Regal Coil Feeder and Pneumatic Shear (Rolls Flashing). 5-Stand x 10” Wide Roll Former w/ Coil Feeder, Pneumatic Shear (Rolls 6” Skirt Panel). 4-Stand x 9” Wide Roll Former w/ Pneumatic Shear (Rolls “V” Bar for Top of Skirting). 8-Stand x 8 ½” Wide Roll Former w/ Regal Coil Feeder, Punch Die, Pneumatic Shear (Rolls Fencing Rails). 6-Stand x 8” Wide Roll Former w/ Coil Feeder and Pneumatic Shear (Rolls Angle Trim). 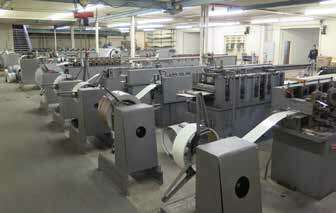 6-Stand x 8” Wide Roll Former w/ Regal Coil Feeder and Kenco mdl. 3K-7-100 Mechanical Shear (rolls 1” Wide “U” Channel Bottom Track). 6-Stand x 8” Wide Roll Former w/ Regal Coil Feeder and Pneumatic Shear (Rolls “U”Channel for Wall Hanger). 5-Stand x 8” Wide Roll Former w/ Regal Coil Feeder, Pneumatic Shear, Crimping Station (Rolls Scroll). 3-Stand x 4 ½” Wide Roll Former w/ Coil Cradle, Manual Shear (Rolls Panel for Window Awnings). 36” Coil Slitter w/ Coil Feeder, 36” Take-Off Coiler and Slitting Dies. Wilder mdl. 2024 16GA x 24” Edge Slitter s/n 24502. Chicago / Pexto mdl. 1018 10’ Apron Brake s/n 115399. Wysong 16GA x 52” Kick Shear. Lockformer 24GA S and Lock Roll Former s/n 21973. Miller Dialarc HF AC/DC Arc Welding Power Source s/n J131947 w/ Cooler and Cart. Strippit Pneumatic Hole Punch w/ Stand and Fence System. 1.5” x 1.5” Manual Corner Notcher. Johnson 9” Horizontal Band Saw w/ Conveyor. DeWalt mdl. 790 12” Radial Arm Saw. Regal mdl. 3501 Motorized Coiler. Regal mdl. 1500-18 Motorized Coiler. Marathon mdl. V-6030 60” x 30” Hydraulic Compactor / Bailer s/n 125205. Quincy mdl. MQSB/T50AAM 50 Hp Air Compressor w/ After Cooler. Joy Screw Type Air Compressor w/ After Cooler. Diamond OBI Stamping Press w/ Pneumatic Clutch, 14” x 20” Bolster. Federal No.3 26 Ton OBI Stamping Press s/n 3-1965 w/ 2 ½” Stroke 12 ½” x 21 ½” Bolster. Toledo OBI Stamping Press w/ 10” x 16” Bolster. Benchmaster OBI Stamping Press w/ 10” x 12” Bolster. Alva Fallon mdl. BT-5 5 Ton OBI Stamping Press w/ 6” x 10” Bolster. Benchmaster 4 Ton OBI Stamping Press w/ 6” x 8” Bolster. 2005 Chevrolet Silverado 2500HD Pickup Truck Lisc # 7V06355 w/ V-8 Vortec Gas Engine, Automatic Trans, AC, Roof Rack VIN# 4GCHC24U65E271383. 1999 Dodge Grand Caravan SE Van Lisc # 5XQK362 w/ 3.3L Gas engine, Automatic Trans, 159,186 Miles VIN# 2B4PG44G0XR278855. 1975 Chevrolet C65 21’ Stake Bed Truck Lisc # 1B59711 w/ Diesel Engine, 5-Speed Manual Trans, Dual Gas Tanks. Towmotor mdl. 502SG5024 5000 Lb Cal Gas Forklift s/n 502S630199 w/ 2-Stage Mast, 144” Lift Height. TCM mdl. FG20N6 3750 Lb Cap Gas Forklift s/n 3453434 w/ 3-Stage Short Mast, Pneumatic Tires.